A few years ago, I went to a work event where I won a pan as a prize in a raffle. While I was a bit bored with the prize at the time, the pan--a shallow 12" round nonstick skillet--has since become one of my favorites for making baked omelets and frittatas. The only problem was that I never owned a round platter large enough to serve said frittatas, so plating was always a bit of a challenge. I'd usually go with a large rectangular one, and just let the sides of the circle hang off the edge--a clumsy solution at best. But a few weeks ago, I found the perfect plate in the sale shelf at Crate & Barrel! 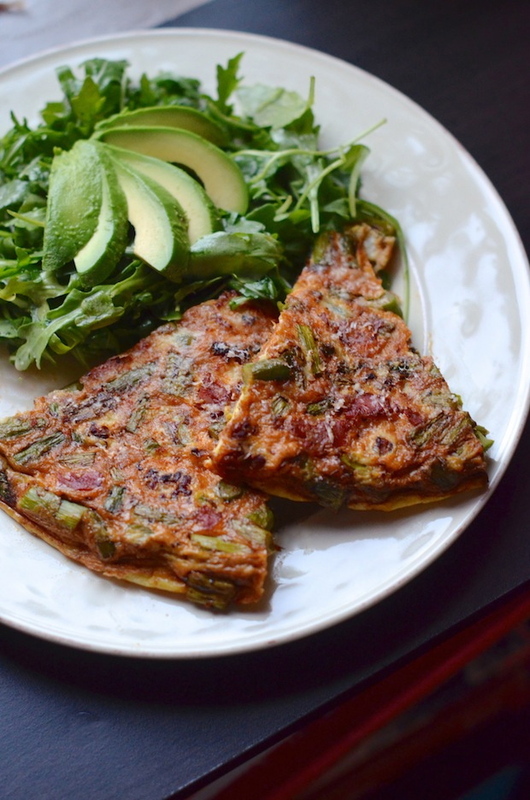 It's huge, round, and perfectly flat, which is ideal for serving frittatas family style on the dining table. Add a bowl of salad on the side and dinner or lunch is served. Now my problem is storage. After doing the dishes yesterday, Eugene came out with the platter and asked me where it goes. "Um...I haven't figured that out, yet," I explained. Because my perfect big platter is too big to fit in any of the cabinets or shelves where I keep my other ceramics, but too delicate to slide in vertically in the slot where I keep my larger wood platters and sheet pans. I've actually just been leaving it out on the dining table where it inevitably gets topped with a pile of mail and keys and magazines. I suppose now I'll have to buy a big cabinet to put it in, but then that would mean I'd have to find a bigger apartment to fit the cabinet. 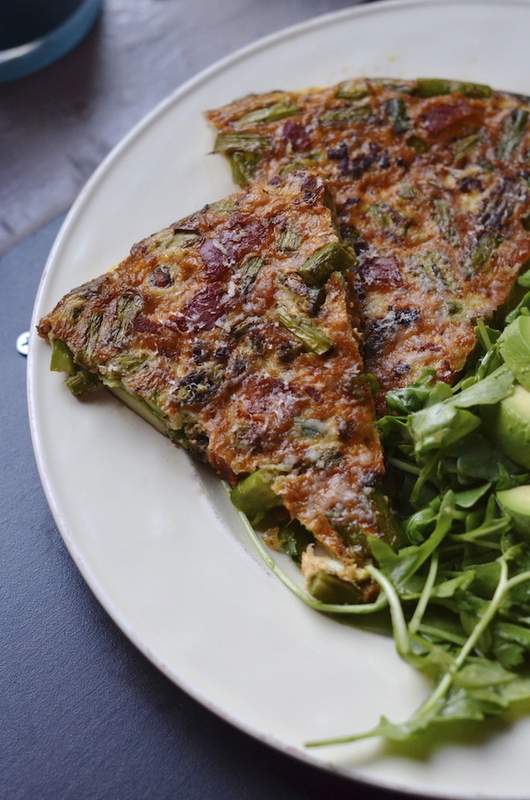 Now this frittata that you see here is anything but imperfect. The combination of salty, spicy chorizo and manchego is already a classic, but diced asparagus adds a fresh, seasonal touch to the dish. I really like to pile in the fillings and only use enough egg to hold it all together. Served with a salad or other simple side, an omelet this size will feed about four. Eugene and I usually have half for dinner and then the leftovers become an easy breakfast or on-the-go lunch. Oh and if you're entertaining guests, you can also cut this into small cubes and serve cold as an appetizer, perhaps with a dot of aioli or pesto on top. I do this a lot and it's always quick to go, regardless of the hour of day. In a large 10-12" nonstick skillet over medium heat, add chorizo and oil, and cook 3 minutes just until some of the fat is rendered and chorizo is a bit crispy. Add the asparagus and saute 2 minutes then spread out evenly in the pan. Whisk the eggs, salt, paprika, and cheese together, and pour evenly over the asparagus and chorizo. Place in oven and bake 10-15 minutes until cooked through and slightly puffed. Flip out onto a serving plate and sprinkle with a bit more cheese before serving.